Brown marmorated stink bug (BMSB), Halyomorpha halys Stål, is an invasive pest native to East Asia. First identified in Pennsylvania in 2001, it has now been detected in 44 states and 3 provinces (Ontario, Quebec and British Columbia), and is of economic importance wherever it is found. There are more than 170 North American plant hosts, including broad spectrum of important fruit (e.g., apples, tender fruits and grapes), vegetable and field crops, as well as landscape trees and shrubs. Many of these crops are important agricultural commodities in Ontario. BMSB survey programs were initiated in Ontario in 2013 and as of July, 2018 BMSB has been detected in 24 counties. In 2017 and 2018, BMSB was surveyed using pheromone traps in agricultural areas on or near farms (i.e., apples, grapes, tender fruit) at several locations with a specific concentration of effort in the Niagara region. There has been a substantial increase in numbers of BMSB in close proximity to high risk fruit crops in the Niagara region in both years. Click BMSB map to see the distribution of BMSB in Ontario. Red = Established, Orange = Possibly established, Gold = Detected and Yellow = Not detected. Nymphs and adults can cause damage by inserting their piercing-sucking mouthparts into developing fruit/nuts and removing plant fluids they use as food. 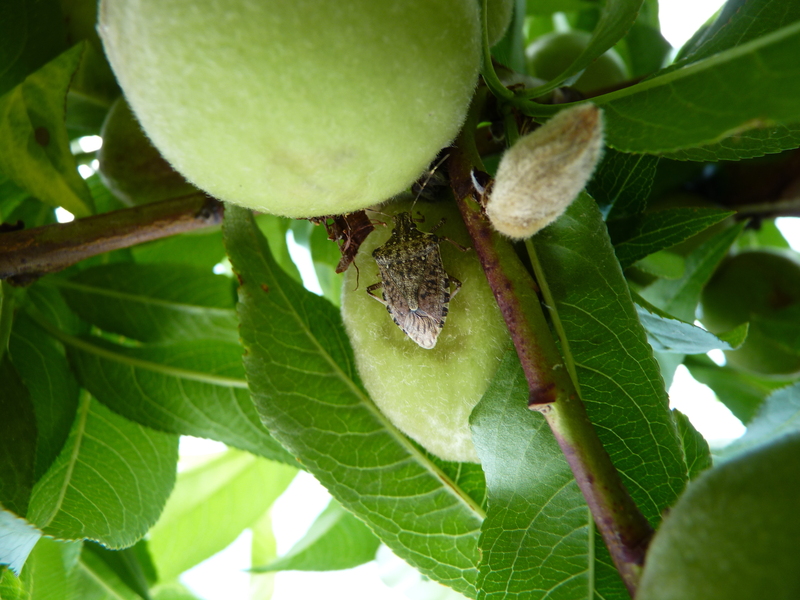 Damage symptoms vary with the crop and time in the growing, and most importantly are difficult to distinguish from damage caused by common native stink bugs such as the brown stink bugs, rough stink bugs, western conifer seed bugs, squash bugs and the predatory spined soldier bug. Other stink bugs have wide host ranges as adults. What makes BMSB different is that it uses so many plants as reproductive hosts – which means injury is caused by both adults and nymphs. The adults are highly mobile and are capable of moving between crops throughout the growing season. The cumulative damage and the extended activity within a crop, coupled with the pest’s mobility, translate to additional monitoring and more intensive management. Brown marmorated stink bug populations tend to peak later in the season towards harvest time of many of the Ontario crops it attacks. Click OMAFRA BMSB Info Sheet 2012 (2) for an infosheet on BMSB. Options for control are listed at BMSB registrations . Note: Malathion is no longer labeled for BMSB.